After a week in the US and a week of jet lag (normally it doesn’t hit me that hard but wow this trip was a doozy), we are back in London for Chris’ final week of vacation. Our trip to Atlanta was wonderful, but definitely not beautiful. It was rainy and cool the entire time. There was no pool time, no Piedmont park, no sun-kissed skin. One night we went to a Braves game and sat, okay actually drank, through a two hour rain delay. Of course we still managed to have a great time and were so happy to attend our close friends’ wedding. Congrats to Adrian & Lyhn!! The sad part about the trip was that I was looking forward to a huge slap across the face of Southern swelteringly humid heat. You probably think I’m a bit crazy for complaining that Georgia wasn’t offering up its usual summer heat wave because, yes, they can be absolutely miserable. But I grew up with these agonizing summers and I’ve been experiencing a bit of homesickness lately. We are coming up on a year of living here in London and while I have nested, found our “local,” and had my share of British adventures, I still don’t know that it feels like home. Missing where I’m from always sends me down memory lane to my favorite moments growing up and let’s be honest, the majority of those revolve around food. Every summer the American Dance Festival takes place in Durham, NC. My mother was very involved in the arts so we attended multiple performances and every year she hosted a cast party for one of the dance troupes. The party involved a late night dinner for the dancers along with a dessert reception for about 150 people. Rumor has it, some years some of the dancers got a little wild and the party culminated in midnight-skinny-dipping in our pool, but all this was after my bedtime. My mom was the master entertainer and had it down to a science. She figured a light summer salad and fresh baguettes was all she needed to make an impressive meal for the dancers. And of course by the time I was about 11, she realized that farming out the majority of the baking to her daughter who was enjoying summer break while she was working all day was not such a bad idea either. But credit where credit is due, she had some amazing recipes for flourless chocolate cake, lemon bars, and sour cream poppy seed cake. Plus she was a very good teacher! This salad is probably the best summer salad you can have. It has stayed in my heart all these years as the epitome of easy entertaining on a hot summer night. Of course, this endorsement might be coated with a heavy dose of nostalgia, but seriously it’s delicious summer perfection. 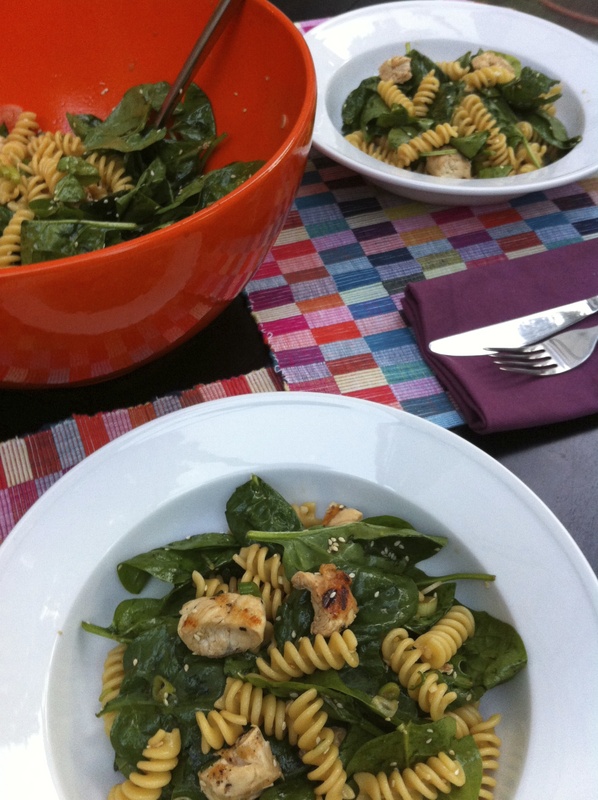 Be sure to not only drain the pasta but run it under cold water to stop the cooking and cool the pasta so that it doesn’t wilt the spinach. Everything can be made in advance and chilled or you can serve the chicken hot off the grill. 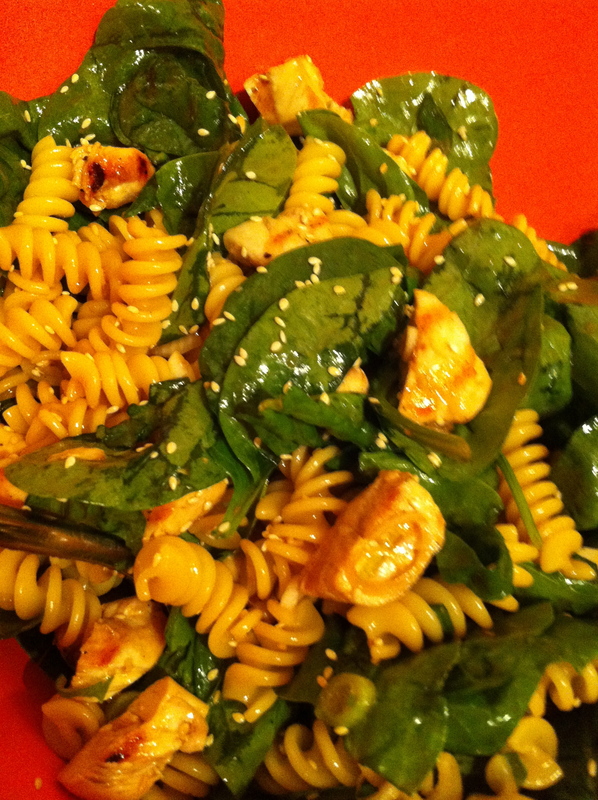 Toss everything together until it is well coated with the salty sour dressing. Seriously this salad rocks. And it is so easy to double or triple for a large crowd. Serve it up for your next dinner party. Make it on a hot summer night. Just cook it ASAP! Heat a grill to medium high heat. 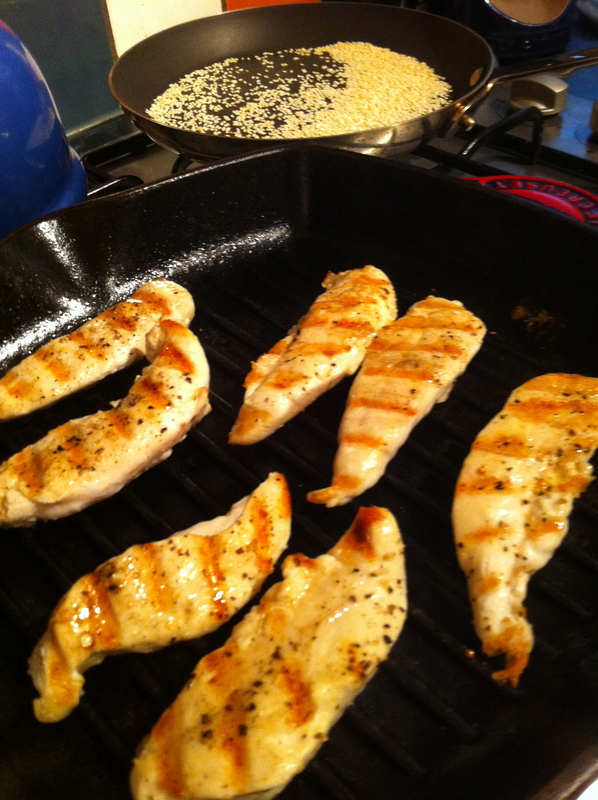 Season the chicken breast with salt and pepper and grill until cooked through, about 5-6 minutes per side. Let rest and cool slightly. Bring a large pot of salted water to a boil. Cook the pasta until al dente, about one minute less than the package states. Drain, rinsing under cold water. 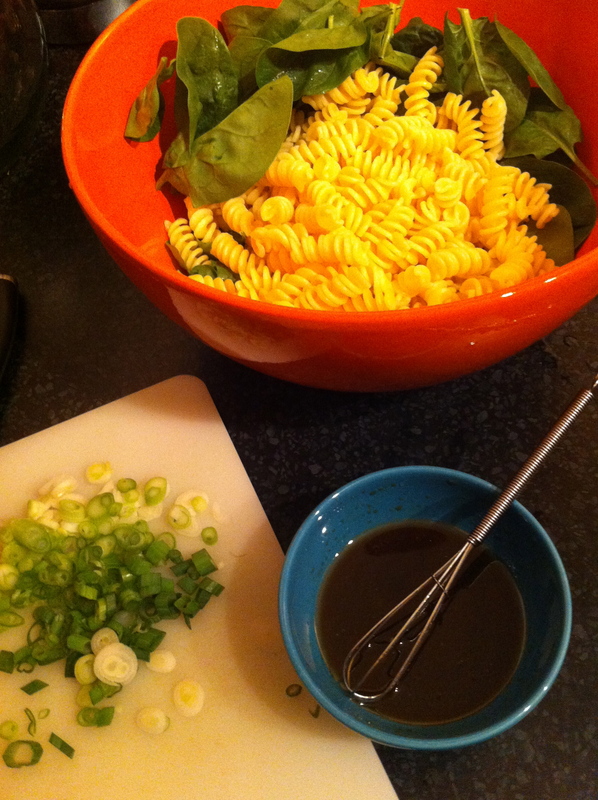 While the pasta boils, whisk together the ingredients for the dressing. 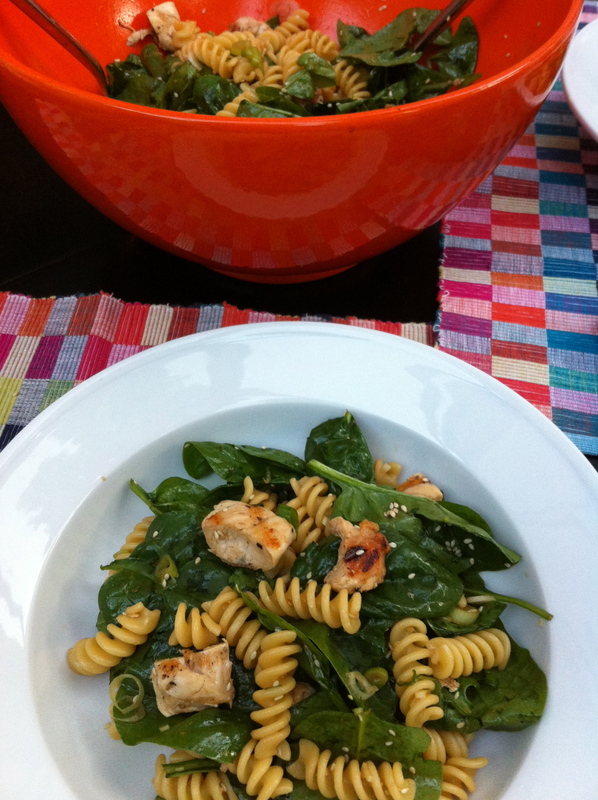 Toss the cooked chicken, pasta, spinach, sesame seeds, and green onions with the dressing. Serve chilled or at room temperature.